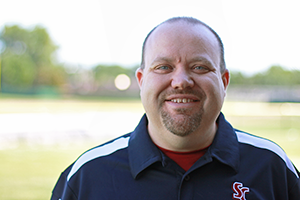 With career goals that could be met all in one place, Pete found himself happily working at Sterling College as the program director of the athletic training program. Pete is passionate about Sterling because "it's all about the people. I am passionate about my students and take pride in the family created at SC in our ATEP." Pete was most recently named the KCAC Athletic Trainer of the Year for 2015-2016, Pete was named NAIA ATA Athletic Trainer of the Year for the 2010-2011 academic year, was inducted into the Barton County Community College Athletic Hall of Fame in 2015, was named the Sterling College McCreery Teacher of the Year in 2015, and is currently the Past-President of the NAIA ATA Board. He loves working with the faculty and staff, who are such an incredible support group. Pete enjoys many activities in his free time including music, reading, eating out and BBQ-ing out with friend; however, all of those are secondary to marrying the love of his life, Kay Manely. His hometown is Lebanon, KS.